What is the purpose of a boxing guard? 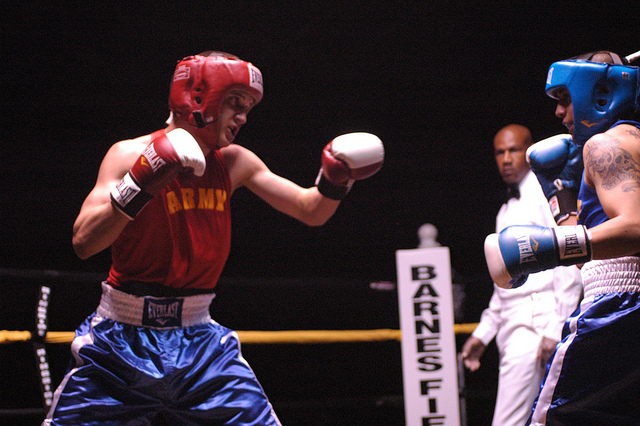 In the simplest of terms, the boxing guard provides the boxer with protection while simultaneously allowing him or her to use all of the offensive and defensive tools at their disposal. The guard provides adequate visibility without sacrificing exposure that cannot be compensated for by skill and reflexes. That last statement is important, because no matter what guard you learn, you will eventually default to your own style and that style will depend heavily on your boxing skills – primarily your defensive skills. For instance - if you are exceptional at slipping punches, you may feel it necessary to hold your hands away from your face and eyes to give you more visibility to react to incoming punches. If you have a super strong core that can withstand a punch or two, you may opt to hold your forearms higher to protect your head at the expense of exposing your core more. The point is to start with one of the boxing guards on this page and from there you can develop and adapt to whatever guard works best for you. As everyone is unique in their abilities and skill sets, you should be very wary of the coach or trainer that tells you a technique has to be done a certain way. Get the fundamentals down - but you are your own guinea pig. Experiment and test things out. Keep what works and discard the rest. You'll likely end up using all of these guards and their variations at some point depending on your opponent. It's good to mix things up. When you learned the basic stance, either orthodox or southpaw, you were told to hold your hands up near your cheekbones with elbows tucked in tightly to your sides. This type of guard is known as a peek-a-boo guard and, in my opinion, offers the most protection while still providing access to the full range of offensive and defensive techniques. This is the primary reason it is taught to beginners, who generally have not developed the required reflexes and timing to slip, parry, or counter incoming punches. To reiterate, once you are in your boxing stance, for orthodox fighters, you bring the left arm up at minimum so that your left fist is resting on your left cheekbone. Some fighters prefer to bring it up even higher – but beware – the higher you go, the more you expose your body. If you can withstand punches to the core, and/or have the reflexes to lower your elbows to block body shots as required, then go for it if it suits you. The right fist is brought up and rests on the right cheekbone, just slightly lower than the left fist. Your elbows are held tightly against your body. Your head is tilted forward with chin to chest and your forearms are straight up and down providing protection of the lower part of your face, jaw, neck, and upper portion of your chest. You’re peeking out between the wall you’ve formed with your fists and forearms and the boo comes when you open it up to deliver a punch or two. That is why it is called a peek-a-boo guard. At the other end of the boxing guard spectrum is the philly shell. This type of guard is only for the advanced, experienced boxer who has developed a lot of coordination and fast reflexes. You completely expose your head to your opponent. Floyd Mayweather Jr likes to use this guard – so that will give you some indication of the caliber of skill you need to employ it properly. Another drawback or benefit, depending on how you look at it, is the path your jab has to take to it’s target. It has a lot further to travel but it gets there at odd angles. It’s not the most efficient transfer of pivot energy and jabs have the tendency to turn into flicker jabs that don't do a lot of damage. The upside to the philly shell is that you hold your fists at two different levels (one near your waist, the other near your head) which can cause confusion in your opponent as to exactly where you are launching your attacks from. Another upside is the visibility this guard provides. With only one fist in front of your face, you can see a lot more of what is going on. Your field of vision is not as restricted. This guard also lets you relax your jab arm and shoulder. Instead of holding it up which takes effort, it hangs out in front of you conserving energy. From the orthodox boxing stance, your right arm is up so your fist is about cheekbone height, but the hand is not resting on the cheekbone. It is slightly more forward and centered on your face as it is the primary fist used for parrying and blocking no matter which side the punch is coming from. The other hand hangs down near your left leg about waist height. Your head is still tucked down, but you really bury your chin into your left shoulder trying to achieve an added measure of protection that disappeared when you moved your forearm and fist down near your waist. You keep your body tilted back with a little more weight on the rear leg to keep your head out of striking distance. If you don’t have the skills/reflexes to backup adopting this stance, then don’t. It leaves you far too exposed if you don’t know what you are doing. As you get more comfortable with punches being thrown at you, you’ll probably find it less and less necessary to hold your hands really high against your face. You'll learn to slip and parry and use other defensive techniques. Unless you like your arms and hands tight against your body face, you’ll probably end up lowering them a bit to aid in your vision and to let you relax a bit. This more relaxed type of guard is known as a mixed guard. The left arm (orthodox) is generally a bit further out from the face and lower. The right arm (orthodox) is also a little more relaxed and generally held a bit lower as well. Obviously the combination of both of these exposes your head, so again, this guard is something you work up to, not something to start out with while you are afraid of getting hit in the face. Try them out - familiarize yourself with each guard. In front of your heavy bag or simply shadowboxing, do a minute of boxing with each guard to get a feel for them. Start with the peek-a-boo guard. Notice what your vision is like and how it tires the arms to hold them high and rigid. Next, relax a bit, opening up the guard and moving around noticing the differences. Last, go to the philly and see what that feels like. One of these guards is going to feel more natural to you than the others - so use that as your base and branch out from there. No two opponents are the same so different guards may have different levels of effectiveness. You'll quickly find out when you're toe to toe.